This 3 Cart Shelf has a Sleek Black Finish. This Steel Trolley is Durable! This 3 Cart Shelf is Among a Large Selection of AC Workstations. Constructed of black powder coated steel for a durable and lasting display. Includes 4 swivel caster wheels, two of which lock for stability. 3 shelves that are 32"w x 20" d with a 1/4" retaining lip for ample storage space. Includes a 3 outlet surge protector to plug in presentation devices. Cable pass-through holes to keep unsightly wires hidden. 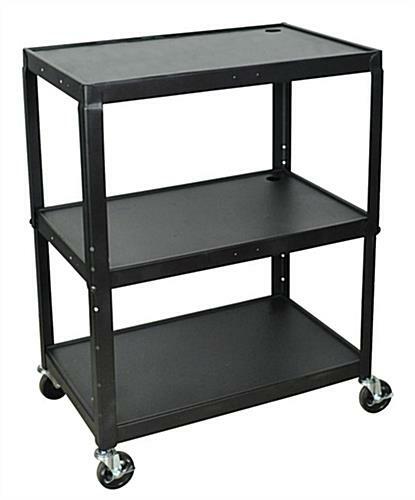 This 3 shelf cart that adjusts in height is ideal for classroom presentations. This deep ledge workstation is great for holding a laptop, projector, and other av equipment! This 3 shelf cart with a black finish, also known as a mobile shelving display, includes a 1/4" retaining lip around the storage surfaces to keep AV equipment from falling off. This display is made of steel which is more durable and lasting than comparable plastic units. 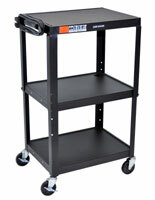 This 3 shelf cart that is mobile is ideal for educational institutions who share rolling storage throughout classrooms. This audio visual stand has a black powder coated finish to suit nearly any environment. This 3 shelf cart includes cable pass through holes to keep wires from presentation devices under control. This workstation has easy to move wheels, which is ideal for wheeling into the ideal space for a presentation and then wheeling out of the way afterwards. This 3 shelf cart has a 14-3/4" clearance between the bottom and middle shelf to provide ample space to store items. This steel trolley is more durable than those with a plastic construction. This 3 shelf cart comes with a 3 outlet surge protector so AV equipment is ready to be plugged in! This trolley is affordable and more durable than plastic utility stands. 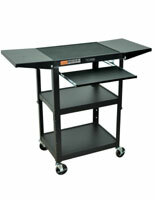 This AV workstation, 3 shelf cart that has caster wheels is simple to move around a room or an establishment. This display has ample storage space which is ideal for cramped classrooms. This steel 3 shelf cart is durable and meant for years of use! This mobile storage is an ideal presentation stand with its sleek steel construction which is stronger than plastic. This workstation is great for use in classrooms, churches, offices, and much more! This mobile trolley is height adjustable from 24"- 42" in 2" increments to suit the needs of the user. Manufacturer model# AVJ42XL.